If a particular case requires unusual or special care, we may refer you to a veterinary specialist. Cases most often referred to specialists are for complicated orthopedic or neurological conditions, advanced cardiac diagnostics and complicated dermatology and ophthalmology cases. Certified veterinarians who specialize in specific areas of veterinary medicine often come to our practice. 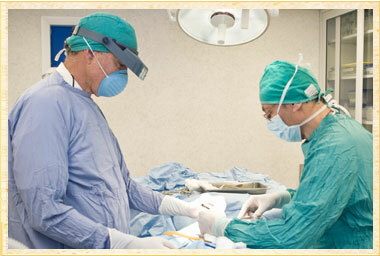 Their fields of expertise are generally cardiology and surgery. Several board certified veterinary specialists who treat cases at our hospital give in-house demonstrations as a form of continuing education for our staff. We work closely with local board certified specialists and with the companion animal hospital at Cornell University to provide medical and surgical care for exceptionally complicated cases.